I came home to Christmas. There was a pretty tree on the baggage claim carousel and evergreen tinsel hanging from the ceiling. The Western world—often unknowingly—inviting God to be with us for one month of the year, every year, with plastic decorations and a rush of capitalism. Or maybe it's that I haven't been able to stop thinking about—something—in the weeks since coming home. I finally made it to our home church this week, after almost two full weeks of being home. The Christmas buzz has only become more intense with the start of Advent and Christmas shopping. It doesn't help that I go to church at the busiest and highest-grossing mall in Canada. And we're singing Christmas carols at church now, too. Emmanuel, Emmanuel. God incarnate, here to dwell. Don't get me wrong—Emmanuel is for all of us. God is with all of us, in all of our mess, in every circumstance and context of life. But as this Sunday's Advent reading is read, the scene of where God specifically chose to come to be with us, at that specific point in history all those years ago—the place He chose when He could only choose one—comes barrelling into my mind. It's the thing I can't stop thinking about—the thing that's been resting heavy on my heart since coming home to Christmas. And I'm suddenly back in the small home of a single mother in Ethiopia, reaching across to squeeze her arm in reassurance as tears flow while she tells me her story. God is with us, there. We like to invite him into our big and bright white Christmases of the West—without even a thought that His choice for where He would come be with us and spend that first Christmas was a small, messy, quiet, humble and dim brown Christmas in the Middle East. I'm not saying He won't meet us where we are—He will fight every distraction and all our excess to get our attention and capture our hearts. But I just can't stop thinking about how close He felt as I listened to the stories of mothers who were afraid when they first heard of their pregnancy...yet chose to say a brave yes anyways. That's all I've been thinking about, actually. I came home to Christmas...but in so many ways, I came home from experiencing all that Christmas was, is and should be—and no matter how many times I do it, it keeps on wrecking me, shaping me, forming me...and I couldn't be more thankful. What they don't tell you about reverse culture shock is that it's never the same twice. Each time, it's different and it doesn't necessarily get easier, but it's never quite the blinding intensity and year-long anguish of the first time...nor does it follow the same path as the last time. It's a unique story every time. What they don't tell you about reverse culture shock is that sometimes you might feel incredibly entitled, childish and privileged for experiencing it, particularly when it's part of your (dream) job...and that writing about it in a public forum sometimes helps like it did when you were fifteen, and sometimes that just makes you feel crazy vulnerable in ways that you don't want to at twenty-one (or ever). 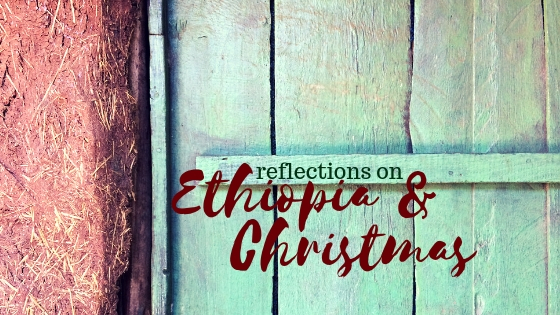 Anyways, I just wanted to pop in on this highly-neglected blog to share some reflections and give some (very small) peeks into what my experience of travelling to and back from Ethiopia was like, to add to (or in case you missed) what's on Instagram. To take the responsibility seriously of stewarding the stories of those I met—and my own story—well. And also to wish you a very Merry Christmas! ... Because apparently I really can't promise that I'll write here again within the next 6 months.